Be the first to share your favorite memory, photo or story of Allie. This memorial page is dedicated for family, friends and future generations to celebrate the life of their loved one. On April 26, 2018 Allie Lee Roland passed from this life into the arms of her loving Savior. Born December 30, 1925 in Buckeye, LA to Frank and Doll Aycock, Allie spent her childhood on the family farm. 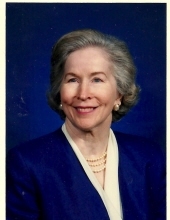 Throughout her education she received frequent academic honors and held numerous leadership positions. She attended college at Northwestern State University, LA majoring in Home Economics. After an internship at Jewish Hospital in Newark, NJ she became a Registered Dietitian and then practiced at the Pineville, LA Veteran's Hospital. Gracious, engaging as well as fiercely independent, Allie Lee was the consummate Steel Magnolia. Always the voice of reason even if mistaken - she was clear in her intent and powerful in her delivery. She turned attention from herself to the endeavors and needs of others, often serving in the role of mentor to younger women. Allie Lee kept herself informed on current issues, particularly in the areas of medicine and science relevant to those she loved. Medical staff described Allie Lee as the most pleasant patient on the floor or even that they had ever worked with. Following her accident, while in the care of her grandson Daniel and his wife, Lisa, she expressed a life time's worth of unique, quick witted responses and wry humor. She also acted in the role of hostess to guests and caregivers alike from the confines of her bed. Throughout it all, Allie Lee maintained her strong faith in God. January 23, 1948 she married the love of her life, Charles P. Roland, in the midst of an 8-inch Louisiana snow storm. Allie Lee and Charles raised three children: John Clifford Roland, Karen Jean (Burke) Anderson and Charles Franklin (Terri ) Roland. As a wife and a mother she served her family with love and devotion. She shared numerous adventures in travel with Charlie related to his career or military history. Twice she traveled across the country carrying everything she could pack for the entire family's summer in the back of a Chevrolet. After living 18 years in New Orleans, LA Allie Lee transplanted herself and thrived in Lexington, KY where more favorable employment opportunities awaited Charlie. Allie Lee is survived by her husband of 70 years, and her three children. Additionally , she is survived by 6 grandchildren: Jeffrey Roland, Michael Anderson, Daniel (Lisa) Anderson, Deanna (Brandon) Headrick, Charles Franklin Roland II, Curtis Roland and 7 great-grandchildren. Beyond these children she has one grand daughter through foster care, Helen Edgington, two foster great-grand daughters, as well as three foster great, great-grandchildren. She is preceded in death by 5 siblings. Services will be held Saturday, May 5th, 2018 at the Clark Legacy Center, 601 Brannon Rd., Nicholasville, Ky. Visitation will take place from 2-4 PM with the funeral service to follow at 4:00 PM. The family requests that donations be made to the Charles P. Roland Fellowship through the History Department of the University of Kentucky, Attn: Tina Hagee ,1715 Patterson Office Tower, Lexington, KY 40506-0027 or to Freed-Hardeman University, Office of Advancement, 158 East Main St Henderson, TN 38340. To send flowers or a remembrance gift to the family of Allie Lee Roland, please visit our Tribute Store. "Email Address" would like to share the life celebration of Allie Lee Roland. Click on the "link" to go to share a favorite memory or leave a condolence message for the family.